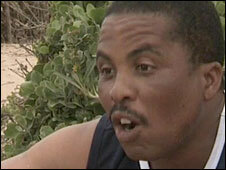 On a blustery beach in South Africa's coastal city of Durban, Dumisani Gumbi is going through a tough fitness programme. He is a platoon sergeant with the South African army. He also has the Aids virus. Since 2001 when he was first diagnosed with the disease, his career prospects and chances of being sent overseas have floundered. For years tens of thousands of HIV-positive military men and women like him have faced a blanket ban. A staggering 30% of South African soldiers are infected with the Aids virus. This reality plus a recent test case have forced the South African government to review its policy. "When we are fighting or when we are doing peacekeeping work, we are not biting the people. We're just being peacekeepers like anyone else," Mr Gumbi argues, dismissing fears that deploying soldiers with HIV is likely to increase the spread of the disease. After a test case brought by one of South Africa's military unions and the Aids Law Project, the government reviewed the evidence and agreed that in certain circumstances HIV-positive soldiers can be deployed overseas if they pass a battery of some 39 fitness tests. "It means people who [have] HIV who are for instance on treatment and who have stabilised and meet minimum requirements will now qualify to be recruited deployed and promoted," explains S'khumbuzo Maphumulo, the lawyer in the case. In what has been called a "nuanced policy", the South African National Defence Force (SANDF) now has to consider each case on its merits and assess the operational requirements of each post. Aids testing for South African soldiers is voluntary but the reality is that if you refuse to get tested then you will not be deployed. With greater knowledge of HIV and availability of anti-retroviral drugs - which soldiers receive for free - the South African military has become a world first in effectively removing the blanket ban and setting objective parameters for assessing whether an infected soldiers is fit to be deployed. Army surgeon general Lt Gen VJ Ramlakan says that while this is an important step forward, he is cautious. "It's not as if the flood gates are open for sick people to be deployed," he says. "The fittest soldiers will go where the task is most demanding. If you are HIV-positive and sick, you will not be on the frontline. "If you are fit and your CD4 [white blood cells which fight infections] count is above 500 then you may be considered," he explains. The army has recently deployed an HIV-positive soldier to Sudan as part of peacekeeping operations in the troubled territory of Darfur. He is the first but there are many others waiting in the wings. Soldiers taking part in a recent military exercise seem to back the new Aids policy. "We've had this conversation and it's not really a problem. We would just like to know who is and who is not infected so we can help them if we need to," says Maj Talia Thomas. As part of the exercise, a helicopter evacuated a casualty from the field. This is precisely the kind of scenario that critics of the new policy worry about. All soldiers are issued with rubber gloves in their first-aid kits to protect against blood-borne diseases such as hepatitis and HIV. During the test case, medical experts said there was no evidence of increased risk of transmission in this way but defence analyst Helmoed Roemer-Heitman is not convinced. He argues it is a massive breach of trust for ordinary soldiers who expect more from their commanders. "What we are doing is exposing them to unnecessary risk. It is bad enough to living under harsh conditions and running the risk of being shot at, we are now exposing them to a situation when one of their comrades could totally inadvertently infect them with a fatal disease," says Mr Roemer-Heitman. The reality is that there are already HIV-positive soldiers operating in peacekeeping missions but their status simply is not formally acknowledged because of a lack of testing facilities in many African forces. The reason South Africa has taken the lead is in part because the health burden of HIV is so huge. It has had to balance the human rights of individual soldiers with the collective rights of a nation which expects a fit fighting force to protect them. Professor Lindy Heinecken, who has researched the issue extensively at the University of Stellenbosch, says we are likely to see HIV-positive soldiers in frontline duties but it will depend what line they do and what the military considers "reasonable and justifiable". The new policy may pose some tricky diplomatic challenges if troop receiving countries object to having HIV-positive foreign soldiers on their soil. Eritrea has already made this point and has voiced its concerns to the UN Security Council, asking it to pass a resolution. It argues that its own people's safety is being compromised. But so much has been invested by the South African military in its troops that it cannot afford to lose qualified staff to the disease. Professor Heinecken points to the fact that "infection rates are highest in the middle ranks and at the operational level" and so the military has had to take a pragmatic approach given its extreme position. 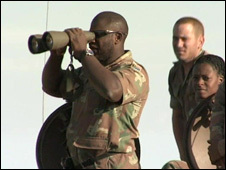 There are some 3,000 South African troops on peacekeeping duties in the Democratic Republic of Congo, Sudan and Burundi. It is an important source of revenue for the country and puts South Africa in the lead as the continent's caretaker. For it to have adopted such a "progressive approach" is all the more remarkable given that South Africa was a country whose leadership until very recently denied the link between HIV and Aids.